It was a first for the Boston Clavichord Society, a program “entirely devoted to contemporary music,” Board President Peter Sykes announced. What composers the likes of Stockhausen, Hovhaness, and Persichetti would have written for the instrument was the real attraction for this reviewer. The 63-key example we heard dates from 1972, a Robert Goble & Son clavichord that keeps faith with tradition. And though all the pieces were composed in the past and present centuries, the bulk hardly sounded contemporary in their frequent referencing of Baroque dances and Renaissance modality. 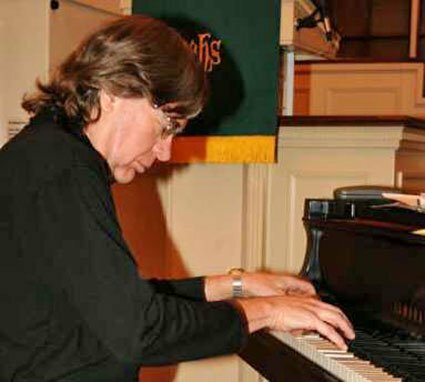 It was Timothy Broege, clavichordist, organist, composer and jazz pianist, who mostly saved the show, bringing to it a mix of adventure, edification, and sheer auditory pleasure. Broege took “Aquarius” for music box by Karlheinz Stockhausen (1928-2007) to the clavichord. Following the composer’s direction to repeat the piece multiple times, Broege did so three times each, with a variation exposing the pellucidity of the high and low octaves of the instrument. As always, to show its appreciation, the audience, who took up every seat in the recital room at Gore Place in Waltham Sunday, quietly waved their programs in the air thereby eliminating higher decibel noises coming from clapping and hooting. As Broege’s program continued, discerning colors and gradations in amplitude were increasingly in evidence. His vibrato, or Bebung, could be both seen and heard, furthering expressivity; this would become more and more noticeable while listening attentively to the small, intimate keyboard sounds so foreign to the high-decibel rates of modern times. Of the ten composers represented, the most fascinating work came from the pen of Watertown’s Alan Hovhaness (1911-2000). His peering into Japanese lens with Dark River and Distant Bell evoked vivid koto imaginings, which Broege displayed in full color, if you will. His shadowy lingering melodic rendering in mid-range concluded with eight low resounding gong-like chords each mysteriously “tuned” by way of shifting tones. Before each set Broege provided background most usually about how a composer came to write for the clavichord, and that was most usually through the composer being introduced first to an instrument maker. Such was the case of clavichord maker John Chalice who captured composer Vincent Persichetti’s attention. Broege believes the sonatinas of Persichetti (1915-1987) are idiomatic for clavichord. Perhaps they were. I did not, however, find the two he played particularly so, save for the Vivace movement from Opus 64, where a good speed and clavichord clout really showed what the little instrument could do. Broege opened with two pieces from Lambert’s Clavichord by Herbert Howells (1892-1983). Modal harmonies and English stateliness rang out. So too did remarkable contrasts of loud to soft that left little doubt about some of the instrument’s capabilities and the performer’s expertise in their realization. Partita for Clavichord “channeled late 17th century” ways as Timothy Broege (1947- said of his own recent piece, which he premiered at the mid-Sunday afternoon concert. The concluding piece was his Paws for a Moment, an all too real show-tune stomper that brought welcome levity yet puzzled—the clavichord and style did not convince, maybe some kind of parody would have worked better with more persuasive results. Broege also played children’s pieces by James Woodman (1957- which quoted “Twinkle, Twinkle Little Star” and “Frère Jacque,” a circuitous piece by Graham Lynch (1957- Admiring Yõrõ Waterfall, Whyms & Fancies for the less mature by Walter Haack (1909-2002) and Prisms by high schooler John Kosinski (1998-.